Mantix4’s M4 Cyber Threat Hunting Platform is available to purchase as a platform, as-a- service directly from highly-trained M4 anti-cyber attack security professionals, or as a managed security service delivered by one of our highly-vetted partners. Learn more about our New Dimension Partner Program. Unlike other security tools that can take months to implement and curate, M4 Cyber Threat Hunting Platform leverages intelligent sensors that can be installed in an enterprise network in minutes. Within 24 hours, the platform is proactively collecting and displaying meaningful information about inbound and outbound traffic from inside and outside of the enterprise network. The platform powers security professionals to be effective threat hunters from day one. Using it, security analysts can more quickly and productively, spot high-risk improper and contradictory behaviors using M4’s forensic endpoint assessment, forensic scans, deep Dark Web analysis and more. Don’t have security professionals on staff to charge with cyber hunting? No problem. Rely on Mantix4’s skilled anti-cyber attack team or one of our partners for Threat Hunting-as- a-Service (THaaS). Working from M4 Cyber Threat Labs, our experienced team consists of security analysts, threat intelligence experts, data scientists and threat hunters. Together we will deploy and run the M4 Cyber Threat Hunting Platform remotely via the cloud, to protect your enterprise. Threat analysis- Mantix4 starts by installing intelligent network sensors directly to the customers’ network. These bi-directional sensors track, record and assess key network activities and behaviors. After a 24-hour network evaluation period, customers receive a complete network analysis that highlights threat activity and outlines tactical and strategic threat remediation plans. This in-depth threat analysis program can be repeated weekly, monthly, quarterly, etc. Continuous surveillance- With the M4 sustained threat hunting service, the M4 anti-cyber attack team continuously monitors the network using vulnerability scanning, deep packet inspection, analysis of network traffic and endpoint memory scanning techniques. Damage control and effective remediation plans– If a vulnerability is detected, our analysts will investigate the potential impacts and root cause of the incident and determine a direct threat remediation plan, assigning responsibilities and counter maneuvers targeted at individuals or specific malware code. We also minimize damage and improve communication, accountability and executive awareness. Communication and coaching- The M4 anti-cyber- attack team knows the ins and outs of the cyber security environment. We will translate tech-speak to provide real-world valuable insights that will protect data and neutralize cyber threats. Sustained improvement- We are continuously innovating and adapting to new attacker tactics, techniques and procedures. We study malware developments and movements and use algorithms to track long-term trends. By collecting data about interactions and behaviors of threats and feeding that data back into the M4 Cyber Threat Hunting Platform, it becomes smarter and generates more effective threat intelligence for more productive future hunts. Mantix4 offers the industry-leading platform that enables cyber threat hunting. The first step to effective cyber threat hunting is to carefully analyze the current state of the network environment. Mantix4 does this by installing hyper-intelligent network sensors directly to the customer’s network.These intelligent sensors immediately start to track, record and assess key network activities. After a 24- hour period of collecting data, the M4 anti-cyber attack team then delivers a complete network analysis, highlighting any hotspots or other suspicious actions. The M4 Cyber Threating Hunting Platform centers on a combination of human-driven process and machine-powered analytics. With the platform, analysts can cyber threat hunt by predictively, proactively and iteratively searching through networks to detect and isolate threats that evade existing security solutions. The platform delivers cyber intelligence, visibility and situational awareness on a day-to- day basis that increases users’ ability to understand the network and proactively address high risk, improper and contradictory behavior. M4 Cyber Threat Hunting Platform enables enterprises to proactively and forensically identify, visualize and disrupt would-be attackers. 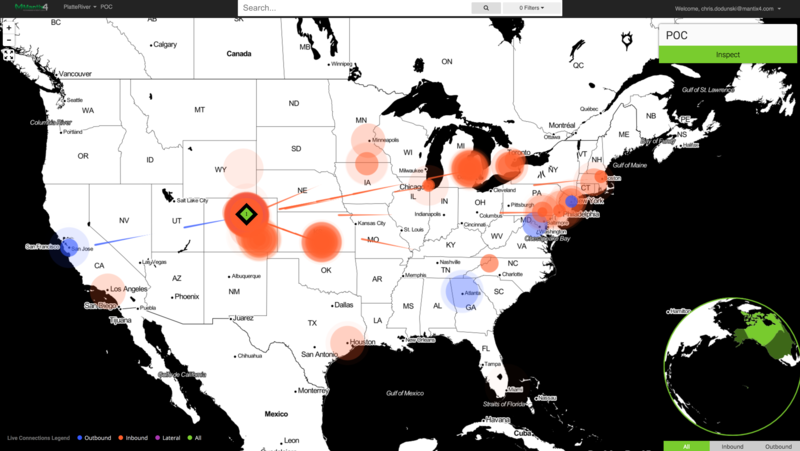 M4 Cyber Threat Hunting Platform uses next-gen visualization technology to prioritize, color-code and tag threats in a specific origin location on an interactive map. 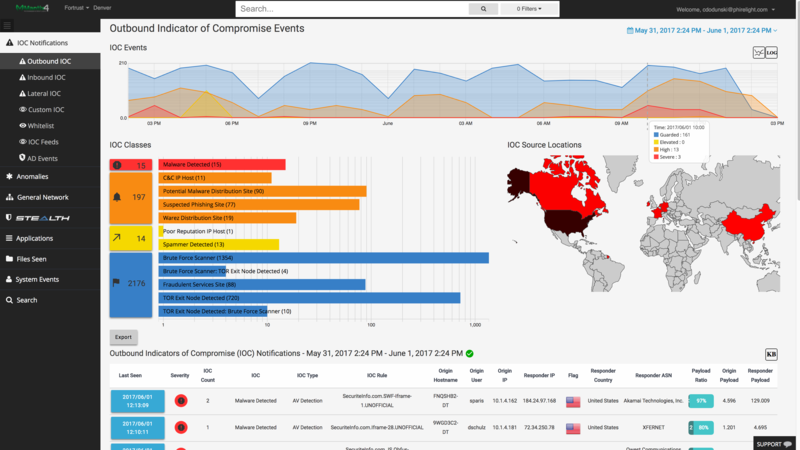 This helps analysts quickly generate threat profiles and visualize patterns of suspicious behaviors and vulnerabilities. Through a single-pane- of-glass interface, users can backtrack and drill down to find out where the threat is coming from, how it’s trying to evade detection, who is potentially at risk, and determine how to disrupt it. M4 Cyber Threat Hunting Platform goes beyond active defense and employs offensive maneuvers and advanced counter measures to effectively collect and gather threat intelligence needed to neutralize adversaries and bad actors. The M4 interface exposes the sequence of events within the malware’s kill chain, analyzing how the adversary reacts to its environment and interactions with the cyber threat hunter. Generated and collected threat intelligence is then logged and fed back into the platform. From here, the M4 Cyber Threat Hunting Platform automatically monitors this and all ‘known’ threats, which improves future hunts and frees the analyst to hunt for other unknown intruders. By incorporating intelligence from threat hunters, along with information about wider industry trends, malware developments, adversary patterns and digital intelligence gained from machine-learning tracking long-term trends, teams have more context about what makes up the threat. This allows for much more targeted threat hunting and threat neutralization and a more fully developed threat hunting model. Overtime, this leads to a more unified and Intelligent Security Operations Center (ISOC). Traditional threat intelligence approaches depend on prior knowledge of a threat. This approach loses the rich context needed to improve an organization’s security posture. Mantix4 takes a strategic approach, providing automated response capability with its ability to visualize and provide context and clarity to the significance of each event. Mantix4’s unique, patent-pending methodology is real-time, constantly and perpetually absorbing dozens of external and internally generated structured and unstructured threat intelligence data from Open Source Intelligence (OSINT), industry (Computer Emergency Response Teams [CERTs] and Information Sharing and Analysis Centers [ISACs]), closed (aka your organization) and commercial threat intelligence provider sources. Through continued evolution and innovation, Mantix4 brings threat dwell times from a US cross-industry average of 99 days* to just minutes, in on premise or cloud networks. Mantix4 Cyber Intelligence Platform and Intelligent sensors are compatible with other mainstream vendors, and is designed to detect and respond to advanced threats that evade other security products. Gartner defines “advanced analytics” as the analysis of all kinds of data using sophisticated quantitative methods (such as statistics, machine learning, descriptive and predictive data mining, simulation and optimization) to produce insights that traditional approaches to intelligence, such as query and reporting, are unlikely to discover. Mantix4’s patent-pending algorithms capture additional cyber intelligence combined with vulnerability scanning and behavioral analytics. This powerful tool delivers real time analytics with unparalleled visibility and degree of known and unknown threats. The result? Mantix4 provides High Fidelity actionable intelligence, finally reducing the noise of incessant logs and alerts. No matter the size of an organization, creating a SOC is an expensive and personnel intensive endeavor, rotating eight to ten people on a 24/7 basis. Speed and accuracy are critical factors in detecting known and unknown threats. This requires continuous training and lightning-fast response times. Mantix4’s High Fidelity, Proactive and Automated Security Orchestration approach lets you reduce resource draining tactics on your security team by automating threat responses to the degrees of threat to your organization. Mantix4’s real-time threat intelligence integration insures you can separate benign threats from severe and urgent threats. Adapt, semi-automate or automate your responses by division, by department, by asset, based on configurations that are response-centric. You can now take command and control back from the basement-dwelling threat actors and nation states that used to keep you up at night. According to Gartner, an Intelligence-Driven Security Operations Center* is designed to control a complex ecosystem and threat environment that changes and evolves rapidly continuously. An ISOC evolves with the environment and threatscape, adapting to new challenges and objectives. In addition, an ISOC must provide the agility that is needed to detect and respond to advanced threats, and provides a feedback loop for adaption and evolution. Mantix4 is the new dimension in adaptive security and we address Layers 2 through 7 – seeing not just one threat vector but seeing everything in real-time, allowing your ISOC to evolve into proactive, and even predictive, security posture. Let’s engage in a fresh conversation. ISOCs are a lean-forward approach designed to know where the puck is going. The feedback loop referenced above forces “the hunt”. Forensic State Analytics (FSA) presumes a network is already compromised. This unique and powerful approach utilized by our preferred solution for post breach detection, Infocyte HUNT, minimizes risk and eliminates malware and threat dwell times. The simple to use interface enables an organization’s security team to become proactive by hunting active and dormant persistent threats, malware and suspicious code. Compatible with Windows and Linux operating systems and applications, Infocyte HUNT is lightning fast and does not require forensics specialists, additional equipment or endpoint software. Threats are identified and scored for immediate resolution. Infocyte HUNT allows an organization to validate the devices coming on the network and spot those exhibiting deviant behavior thereby providing a compelling solution to thwarting both known and unknown attacks. Mantix4 is an authorized Infocyte HUNT Reseller. Mantix4’s innovative Cyber Threat Hunting changes the rules of asymmetrical warfare, employing white hat deception (e.g., canaries and honeypots) while exposing and eliminating threat actors in your network before they detonate. Finally, you can achieve proactive threat-hunting that does not rely on signature or rule-based detection mechanisms. 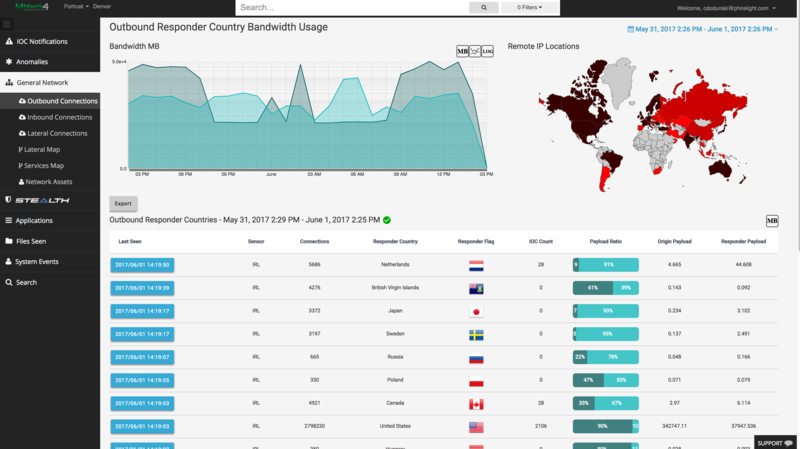 See inbound, outbound and lateral threats in your network in High Fidelity clarity for the first time, in real-time. Gone is the ocean of false positives that blind most security teams. Many products try to offer intelligence, when what you really need are answers. Mantix4 provides answers, lightning-fast, accurate, actionable and reliable. You are always just a few clicks away from identifying known and unknown threats, right down to an infected IP address in your network. Schedule a demo today and see the difference in High Fidelity from Mantix4. Mantix4 changes the rules of asymmetrical warfare. An enterprise security team isn’t truly proactive until it is cyber-hunting known, unknown and advanced threats. With continuous monitoring and deviant behavior collected throughout your networks, Mantix4 also correlates intelligence from over 40 different threat feeds gathered by commercial, open source, private research and government white hats. We will continue to add threat feeds, especially from the Dark Web as they become available. Imagine proactively going after threat actors by using “canaries” and “honeypots” using the Mantix4 Forensic State Analytics tool! Schedule a demo today and see the difference in Proactive security from Mantix4. When securing your organization, time is your enemy. Many approaches automate post-breach forensics, but by then the damage is done. The sheer magnitude of security logs and alerts, including the false positives, can paralyze and rob precious time from your security team. Mantix4’s High Fidelity visibility and automation is 30X faster than traditional manual efforts. Automating your Threat Management with cyber-threat hunting and remediation eliminates the lost cycles spent on reactive security energies that often fail to identify threats that have been dwelling in your network for months. Schedule a demo today and see the positive impact on your security team with Automated Security Orchestration from Mantix4.